1 -Obtaining Registration Certificates for trademarks and trade names and patents. 2 -Search trademark background or feasibility study, prior to the application of trademarks and trade names. 3 -Formal registration of trademarks, trade names patents. 4 -Trademark renewals and patent annuity payments in general. 5 -Amendments and modifications to records. 6 -Oppositions to third party registration of trademarks, trade names and patents. 7 -Request of nullity, cancellations, Claims, litigation. 8 -Proceedings against industrial property law violations. 9 -Legal proceedings against counterfeiting of goods, Defense of copyright, trademark and patents rights. For personalized information and contact to one of our lawyers click here. For more information on Trademarks search in each of these jurisdictions please click here. Thanks to our service Trademark law; you can now evaluate the status of your brands before its formal registration of the same. WDA has a team of elite professionals who will accompany you through both pre and after registration stages giving our traditional 100% personalized service, and immediate response to each of your questions. For personalized information and contact to one of our lawyers click here. 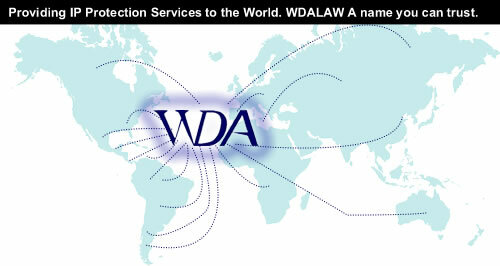 WDA LAW is the Leader of intellectual property firms throughout the Americas, specializing in docketing trademarks maintenance of patents; representatives to exclusive and high-profile plaintiffs in cases of trademark counterfeiting in the Americas for leading manufacturers of renowned spirits and pharmaceuticals products; Representative of big corporations from Europe, Asia and U.S., headquarters in Miami, Florida, USA And Santo Domingo, Dominican Republic.